Heinrich Picot de Peccaduc, Freiherr von Herzogenberg, as was his full name, traced his lineage from a French aristocratic family. He had been born in Graz in Austria and studied also in Munich and Dresden before he went to Vienna to study law, philosophy and political science. Soon he turned to music and was at first influenced by Wagner. Then, after studying Bach’s works he became a classicist and met Brahms with whom he became friendly. They corresponded frequently but Herzogenberg married a former pupil of Brahms, Elisabeth von Stockhausen. Brahms was very fond of her and after the marriage the elder composer rather cooled towards Herzogenberg. He rarely had anything positive to say about his compositions. Only towards the end of his life did he say that “Herzogenberg is able to do more than any of the others”. Of Herzogenberg’s 108 opus numbers thirty were dedicated to songs. 124 solo songs were printed during his lifetime. In 1999 pianist Philipp Vogler and soprano Hélène Lindqvist found a volume with a selection of the songs. They liked these a lot and then Konrad Klek of the International Herzogenberg Society sent them the remaining songs. The 24 songs presented on this disc account for roughly one fifth of the total oeuvre. They represent a cross-section of his production, set out in chronological order. They include his very last published work, the sad Drei Gesänge Op. 108, expressing longing for his late wife, who died in January 1892 at only 44. This is a recurrent motif in many of his late songs. Generally speaking it seems that in later years Herzogenberg found a melodic expressivity that elevated his songs to the purity and honesty of Brahms’ best works in the genre. The Op. 91 songs from 1895 to texts by Eichendorff are arguably his most inspired creations. In particular Der Vögel Abschied is possibly the most moving tribute to his wife. Herzogenberg was rather discriminating in his choice of poems. Many of the great poets are represented here: Eichendorff, Rückert, Mörike, von Brentano, Goethe and Heine. There are also songs by lesser known poets: Johann Georg Fischer (1816 - 1897), “the last noteworthy representative of the traditional Swabian School’, as Wikipedia has it; and the Austrian Wilhelmine Gräfin Wickenburg-Almasy, who was also a singer. She also died at an early age. Of the earlier songs Morgenlied is attractive, Goethe’s Wehmut with its chromatic accompaniment is one of the best songs, but Gottfried Keller’s Schifferlied (tr. 9) is the most immediately catchy. Theodor Storm’s Abends (tr. 12) is wholly delightful - simple but gripping, and the only Heine song, Treue (tr. 14) is also deeply felt. Listening through all the songs in one sitting, some of them were inevitably more to my taste than others. Even so it was fully obvious that here was a deeply serious composer and very competent. When I reached the end and the Op. 108 songs, Brahms’ verdict seemed plausible: “Herzogenberg is able to do more than any of the others”. There may be echoes of Brahms here and there, but there is no plagiarism, quite the opposite in fact. Herzogenberg stands out as a very personal voice. In Hélène Lindqvist he has a sympathetic advocate. Of Swedish and Egyptian parentage she secured her basic vocal training in Stockholm before she went to Saarbrücken and the Mozarteum in Salzburg. She has had a busy operatic career in Germany since the late 1990s but has also devoted a lot of time to The Art Song Project, under which rubric she and pianist Philipp Vogler search archives for forgotten songs and forgotten composers. Equipped with a flexible and expressive voice she makes these songs come to life as naturally as possible. Whether this is just a false impression I’m not sure but it seems that she is at her very best in the later songs on this disc. That she and Philipp Vogler have worked together for more than ten years is also very clear when one hears their sensitive cooperation. 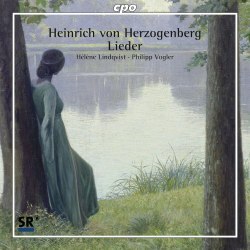 The recording is everything one could wish, CPO provide texts and translations in the booklet and the liner notes are by Konrad Klek of the International Herzogenberg Society. Aimez-vous Brahms? asked Françoise Sagan, more than fifty years ago. If you do, this disc could certainly be something for you.